It’s Time D-Heads! 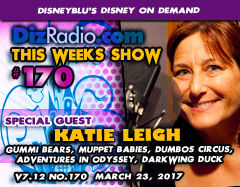 This week grab a big bowl of cereal and sit on the couch to watch cartoons as we welcome the iconic KATIE LEIGH (Gummi Bears, Muppet Babies, Darkwing Duck, My Little Pony, Dumbo’s Circus, Dungeons and Dragons, Adventures in Odyssey and more!) to the show! Katie stops in and discusses her career, projects, legacy, favorites, memories and more. In addition no show is complete without the D-Team and Paige is here with the magic for your ears in the Magical Music Review and Domenic let’s the dogs out as he brings you an all-new Disney’s Short Leash. We have Cody taking a stroll on the Hollywood Walk with more about Katie Leigh. And Jason is here digging deep into The Vault with another Blu-Ray and DVD you have to add to your collection. There is news fresh off the D-Wire with the latest news on Magic Kingdom, Beauty and the Beast, Moana, Walt Disney Records, Disney Channel, Perfume, House of Worth, Zootopia, Cars, Disney Springs, Capcom, Rescue Ranger, Ducktales, and more.